The answer is: Not much at the end of the day, as they are both boxes designed to hold and transport the dead. Really, the primary difference comes down to shape. The word coffin dates back to about the 16th century. It typically has six or eight sides, tapering down toward the feet. If you think of the old-school vampire movies you’ve seen, such as Dracula, they typically had coffins. This kind of construction would allow you to save on the amount of wood needed, and also allows you to know which is the top or bottom of the coffin. Typically the cover is separate and removable. The word casket dates back to around the 19th century. Initially it referred to a basket which would carry jewelry or small valuables. When referring to a burial casket it traditionally refers to the four sided affairs we see most commonly in traditional funerals in the US today. It will often have a split-top allowing the upper portion to be kept open during the viewing, but the cover is usually attached to the body of the box (of the box, not the body in the box). Incidentally, the tendency toward a casket instead of a coffin seems to correlate with the switch from mortuaries to funeral parlors. Seems that a casket is less depressing, in both name and shape. Yet another effort to perhaps further dissociate ourselves with death, so we leave it to the professionals. Or not. You be the judge. This entry was posted in blog, buy a casket, death, death and funeral history, death doula, funeral planning, grief, mourning doula, pre-planning, protect yourself, undertaking, when a loved one dies. Bookmark the permalink. 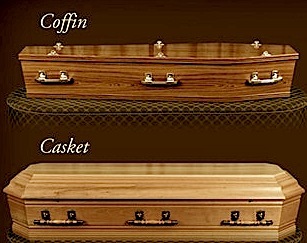 ← What the Heck is Coffin Furniture?